These are pretty much two of the most awesome boys I know. Dexter is 11 and constantly amazes me on the guitar. He has been wanting to learn jazz and blues guitar. Since we were just not about able to come up with the funds for Berklee we sought out something local. He will be going over the hill to a music shop and get said lessons. He goes and meets the instructor today. Apparently he studied music and has a degree in it. 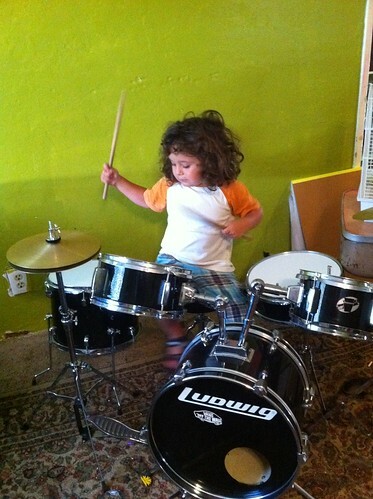 Waylon will be getting drum lessons. The local shop refused him so again we will be traveling over the hill. He is also really excited. I kind of daydream about them playing some funk music together, we need a bass player now. That is just all in my mind though. Who knows what will happen. I have purple hair and my Eddie Veddar album came. Am I too old for colorful hair? or too young? I think it's the right hue. I get lots of compliments when I am out with my purple and black hair with red lips. Mostly from drunk cholos and old white women. I love old women in general. So those compliments make me happy. For some reason I thought a trail walk in 100 degree weather would be fun. Well, it was and we even had lunch. Where are my kids hats? That's right we don't need any stinken hats. We left shortly after this for a friend emergency and enjoyed the rest of the day pool side and inside. Wednesday, I went to an old friends house. We have not seen each other in over 15 years. He is still very much himself and we have more in common now. It was a great day visiting him and his family. We talked, drank honey tea and played video games. His kids and mine got a long famously and I smell a betrothal between his oldest son and my daughter. I like when I get together with old friends and it's like a day has not passed. Today my Lego loving, thrift shopping boy turned nine. 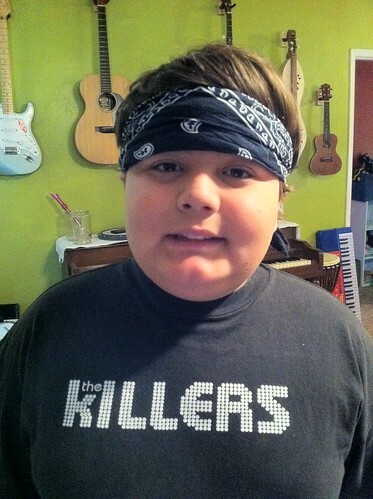 Oh my goodness can he be nine? Apparently so. I was gone the first part of the day on an emotional journey of getting a friend for a mental hold at a hospital and taking another one to the cemetery after 20 years to visit her oldest daughter. When I came back into town it was all about Joaquin. He had a Neapolitan shake, went to Target for Legos and went thrift shopping at The Goodwill Store. We came home for dinner and cake. It was a good day. I feel badly we missed the Katy Perry concert but, she returns to LA in November. I think we have a date coming up. I have been out in the garden more these days. Thank you summer for coming around. I have been able to pick various beans and peas. YUM! Although, my garden is much smaller than last year I am still happy. At one point I thought I had lost it all. So I am pleasantly pleased to say the least. I have some hopes of having more time with some old friends this summer. Lots of plans nothing real definite except, Saturday night. Sometimes I overthink I pressume people will have a horrible time with me. Then I realize if I am not cool enough for them, it's because I am a nerd. Oh, I know that I am but, it is okay. In other news I started walking again. Lucky me I have been encouraged in my weightloss by my husband and my good friend Jeremy. Jimmy is going to get me some new shoes since my little weightloss has shrunk my feet and blisters are not fun. This weekend we plan on going to a PowWow and scarfing on Indian Tacos. Wonder if I will be awake enough for Saturday night? Not only have I been sick. These are two of the five cute faces who were sick as well. Not cool. I missed a lot of things being sick, but it looks like it was a good thing. I would have been upset, hurt and miserable anyhow. Looking forward to this weekend, we have the Autism Rocks Festival and going to spend fathers day with my friend Angie and her family. It will be cool to see her and her boys. Jimmy and her hubby get a long which is weird. He is not usually friends with males. He really does need a good female friend. He thinks most men are macho and showy. He cracks me up....oh wait my best friend is male and thinks the same thing. There must be a reason they are in my life. I really wish my ear was not plugged up still. I feel like I have a nasty ear. Kind of gross but, the high cost of having allergies and remaining off of medications for them. Once my balance is back I need to start going to roller derby and see if I can balance myself. For now that would be all. A while back I was hit from behind in a rental car. My tailbone was hurting for awhile and it passed before I could get my x-ray. Now the right side of my hip is in pain. So I guess I need to follow up. Really hoping this is temporary. We are planning our move to Austin. I am excited but, also kind of sad because I have a few good people I will miss. You know, the kind of people you wish would just move where you move, and become the family you wish you had? Yep a few of those. I have been doing more with my life that I am interested in. Taking the kids out more doing this and that. I want to do as much as possible in California before we leave. I can't wait til we go to the Mission in Oceanside and to the surf museum. The surf museum is a surprise for Waylon as he is interested in surfing. He is an amazing kid. He is four years old and wide eyed. I still can not believe he will be five this month! Unicorns were in high demand. park fun with a new friend visiting from Austin. It was almost like they had always been friends. There was also mad amount of thrift shopping this weekend. There was lots of planting of edibles. Sunday was so amazing. I took Maggie with me to go and visit my friend Tanni, we had not seen each other in 19 years. It was like there was never gap in our being together. When I was in 10th grade, she was my best friend. She was an amazing non-judgemental feminist hippie. Oh wait...she still is. Never in my life have I had such an amazing girl friend. I am beyond ecstatic that we have connected again. We will hang out again this week before she is Austin bound. What do you want to try next year? Is there something you wanted to try in 2010? What happened when you did / didn't go for it? Good questions really. Next year I would really like to try and get into an exercise routine. I need to do more daily exercise since I am mostly at home. I am dropping weight and I feel like my abdominal area will soon be down to my knees and that just seems so unsanitary and heavy. The weight of it and my breasts already give me some discomfort. The body needs more toning, stretching ad a few yoga poses just are not working right now. I found a few DVD's that I want to try. I did really well once with TaeBo. Those VHS tapes got worn out and died long ago. This year the one thing I wanted to try was to lose some weight. I lost about 35lbs. Losing the weight has been good for me. Another thing I wanted to try was to move off of Carson Street and I did that as well. I hope I can accomplish my 2011 goals!